California may be an agricultural center of the nation, but more than one million Californians live in neighborhoods without easy access to a full service grocery store. This lack of access to fresh foods can lead to poor health outcomes and diet-related diseases, including diabetes, heart disease, and obesity. Communities of color are disproportionately affected. Capital Impact Partners has worked for years to address this issue, and to help more communities get access to grocery stores or mobile markets. The California FreshWorks Fund launched in 2011 as a collaboration between Capital Impact Partners and The California Endowment to create a financing mechanism that would fill the gap in California communities without easy access to grocery stores or other healthy food retailers. The Fund even had some support at its launch from First Lady Michelle Obama, who lauded its fit within her national food policy efforts. While The FreshWorks fund financed traditional retail, we saw the need to also support local social entrepreneurs as they developed projects to increase access to healthy food and to contribute to their community’s economic and social health. As part of this initiative, we developed a small grants program dedicated to providing statewide support for organizations working to improve food access in California. We made 53 grants, funding a diverse portfolio of projects across broad subsectors including mobile retailing, social entrepreneurship and innovation, and workforce development to advance social impact within the food system. Although the administration of The California FreshWorks Fund transferred to partners at the Northern California Community Loan Fund earlier this year, we wanted to document the impact of the small grants program, which has deployed over $2.1 million toward innovative community projects statewide to date. We surveyed our grant recipients on their progress since funding, and their perceived success of the grants program. Of the 30 grant recipients who responded to our survey, the majority reported sustaining or expanding their programs beyond the grant funding. Of those, 13 groups were able to leverage their grant to secure additional grants or other financing. Three projects are now financially self-sufficient. Small investments ($5,000-$50,000) can have large social impact. They support business development and planning, and can help scale up projects through marketing, outreach, and purchasing additional equipment or space. Food organizations are doing a variety of things in their communities that improve access to healthy and perishable foods and programs like this can help amplify those efforts when other funding is not available. While the numbers tell one story, it’s not until you meet the individuals working to launch these projects that you understand the true value of the program. To illustrate that, we took a deeper dive into three projects that exemplify the mission of the small grants program. I’ve provided brief snapshots of each with the opportunity to download their full case study. Community Services Unlimited (CSU) was founded around food insecurity and access issues in 1977, and has been bringing weekly pop-up produce stands to South Los Angeles for the past few years. With two capacity building grants from The FreshWorks Fund totaling $40,000, CSU has purchased bicycles for produce delivery, developed a marketing and branding initiative, and started preparing renovations to the Paul Robeson Community Center, which will be its home base. This funding helped the CSU grow from serving 15 families in 2007 to serving more than 9,000 families in 2015. Once the renovations to the Robeson Center are finished, CSU will support about 15 new jobs and serve as a business incubator and a community wellness space. “Before the FreshWorks pre-development grant, banks weren’t even noticing us with regard to getting a loan. Now we have a building. We have assets. We can be very specific and tell (banks) this is what we need, this is the long-term benefit to the community,” said CSU finance director Dyane Pascall. Pascall hits on the biggest achievement of the small grants program: positioning these projects for further growth by giving them the funding they need to build their assets. Download their full case study here. For the Asian Pacific Islander Obesity Prevention Alliance (APIOPA), lack of access to culturally appropriate produce is a huge hurdle to keeping the Asian Pacific Islander (API) community in Los Angeles healthy. For low income API communities, the barriers to full service grocery stores are an additional hurdle to healthy eating. In an effort to stem obesity and chronic diseases, APIOPA founded the Roots CSA, a community supported agriculture program that brings culturally relevant produce to local markets. 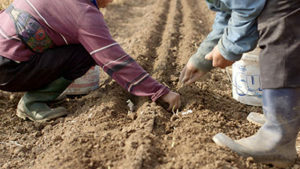 The produce, sourced from Hmong farmers in California’s Central Valley, includes bok choy, Napa cabbage, and Japanese eggplant, which are not easy to find in California’s smaller markets or convenience stores. Bringing familiar produce to Asian communities in Los Angeles helps families cook healthier meals, and reduces obesity-related health problems. Grant funding allowed APIOPA to purchase a cargo van for produce pick up trips, and allowed APIOPA to bring 10 times more produce from the Central Valley to Los Angeles. The CSA, which started with 10 members at one pick up site, now serves more than 120 families at 10 sites throughout Los Angeles. APIOPA is now planning to further expand in to the suburbs around Los Angeles, and recently received a $200,000 grant from the Kellogg Foundation to study food hubs, with the intent of founding its own. Founded in San Diego, Kitchens for Good (KFG) takes useable but imperfect or near-expiration food and turns it into healthy and affordable frozen meals and shelf stable items. The organization also runs programs that provide meals to seniors and culinary training and life skills to former foster care youth and formerly incarcerated young adults. 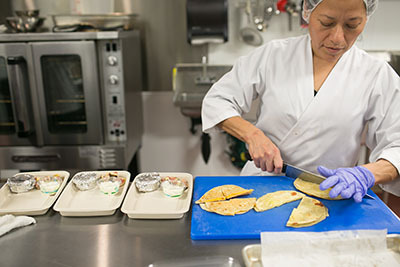 While Kitchens for Good had an operations site when it approached FreshWorks, it did not have all the equipment needed for its commercial kitchen to be operational. Through a $50,000 FreshWorks Fund grant, KFG was able to purchase equipment and improve its cold storage capacity. Our investment in KFG paved the way for it to start the revenue generating programs that support the rest of its work, while also helping to expand the number of people it serves through its senior meal deliver programs. The FreshWorks grant also helped KFG get additional funding. Kitchens for Good is now talking with potential lenders about financing options for purchasing a former industrial-scale bakery in order to expand its capacity for culinary training and production of meals for seniors. They hope to include a café in the new space, which is in a neighborhood currently without access to a nearby grocery store. As these stories and others from our survey illustrate, a small grant can have an immense impact. These grant funds are more than just an investment in an organization. They are a catalyst for bigger grants, bank financing that was previously inaccessible, and expanded programs and services that are improving communities statewide. Our investment in these organizations helps them leverage assets to scale their programs, which increase access to healthy food and contribute to better economic and social health in their communities. Moving forward, we hope to continue to partner with these type of high-impact organizations, using our full suite of financing options that range from flexible debt to catalytic awards to build equitable food systems. We use these finance tools to support the growth of food enterprises by funding innovative programs, equipment purchases, and rehabilitation, construction or land acquisition. For more information, we encourage you to read our healthy food financing fact sheet which includes example deals or contact us to talk about your specific needs.